Now coming to the present scenario, after I started baking, I always wanted to try out carrot cake and I even bookmarked a recipe in one of my favorite cooking books, “Everyday Cookery, Baking series”. 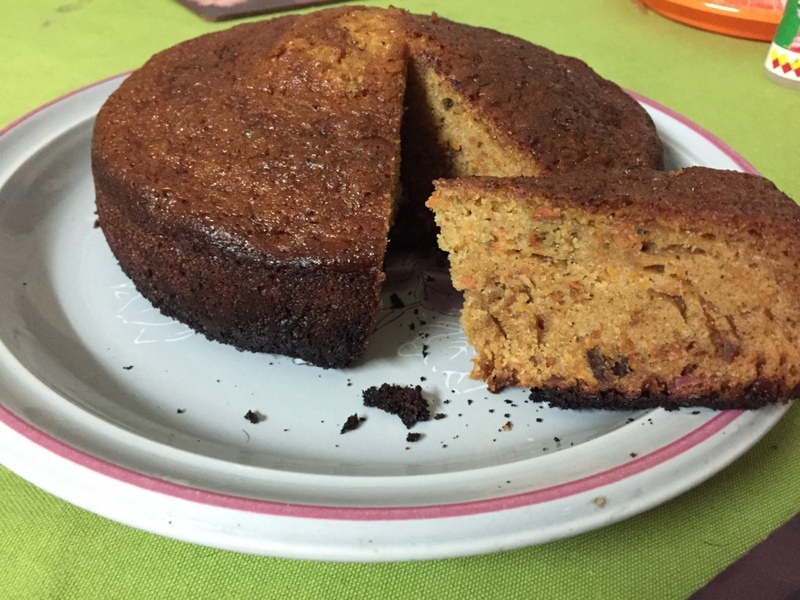 But again, Divya told me she got a wonderful recipe for carrot cake from one of her aunts and told me its a must try and here I am :)Â and I am repeating her words to you guys, IT’S a MUST TRY!! Thanks Suganya :) Mashed bananas instead of ghee, sounds good and its healthy too, so will try it out next time when I make this cake. I am a big fan of Carrot cake and was looking for the receipe for sometime. I am definetely going to try your receipe. Will let you know the outcome. Thanks again. i also add Banana to this cake. I love carrot cake !!! Hi. I loved going through ur blog. Will definitely try out some of ur dishes. I am a malayalee Muslim from Kannur settled in Dhaka, & always turn nostalgic remembering kerala curries. Since accurate baking is important can you confirm by email what size of pan u used for baking the carrot cake? Would very much appreciate it. Zeenath, thanks a lot for your wishes. Happy to know that you like the blog :). Please do try the recipes and let me know. Wish you and your family a happy year ahead!! 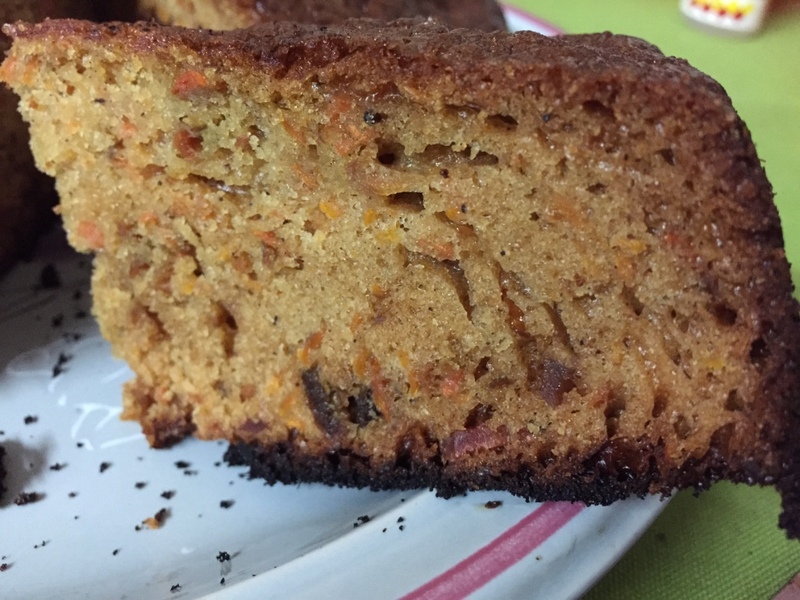 hi , i baked this carrot cake yesterday for easter and it came out simply great ..very tasty….thanks for the recipe…. Really happy to know that you liked the cake. Thanks a lot for letting me know about it. Hope you had a great Easter with your family. have a wonderful holiday…waiting for ur new recipes.. Thanks for the wishes, am back in Bahrain after the holiday. Sorry for the delayed reply, I reached Bahrain only yesterday after my holidays. I followed it exactly and the syrup came out well. Please do try it and let me know whether it came out well. After reading all these blog Iam soooo tempted to make carrot cake, but I dont have an oven with me, will it be fine if I bake it in a pressure cooker, without using the weight? Please do try out the carrot cake, am sure you too will like it. Though I havent baked it in a pressure cooker, I think you can do that. Here is a link about baking in pressure cooker. So I can ask you some Punjabi recipes right :)? Please do try out other recipes also when you’ve time. Delicious cakeeee……….it came out great……with cream cheese icing and tutty-fruity………it is even better………..my family loved it…..thanks for your wonderful recipe…………………. I have been an active reader of your blog. I have tried some of your recipes and they have come out well!! Thanks a lot..One taste that still lingers in the mouth is Lemon and Date pickle..It was soooo yummy!! Have a question on this one? This is my first attempt at baking. I was looking for a recipe and remembered about your blog.. (one of my references at cooking he he ) Did you use cake mixer to mix the dough together? I dont have one and was wondering if I need to get one. I tried this recipe and it came out really well. :):) I was so happy when it came out, I called up home in India and told everyone. Thanks a lot !. I bought a hand mixer and used that. I guess that is the way to go about it.. I am really sorry for not responding to your query about hand mixer. Since I was in India for holidays, I was a bit busy. Anyways to answer your query, i generally use an electric mixer for all the cakes, unless the recipe specifies hand mixing. Am really happy that you went ahead and tried this cake and so glad that it came out well for you :). Now since you have the hand mixer, you will be baking big time I guess. Hi.. Carrot cake came out nice and soft and yummy.. great recipe, thanks! I was looking for carrot cake recipe for long, after I had one from one during a buffet lunch. Me and my hubby liked it very much… Y’day ws our wedding anniversary and I made the cake in the way you mentioned.. It came out excellent!!!!!!.. for surprise my 7 yr old son also liked it.. he was around me once i finished baking :)… Normally he will watch around and peek into what all ingredients i am using.. he normally won’t like carrots and all( most of the veggies of course ;) ).. and he helped me to powder the cinnamon……. Once again thank you very much….. Thanks a lot dear for trying out this recipe on your special day and very happy to know that your son also liked it. This is the first time i’m writing to you & the first time i have used one of ur reciepes. I dont like cooking much but thought to give it a shot due to one jobless week end ! Yesterday was the first time i attempted to bake a cake, ( I have neither baked nor seen anyone bake a cake before ). I’m very excited that you baked your first cake using a recipe from here :). Thank you dear. yesterday I tried your carrot cake. So delicious that not even a single piece left for the next day. It’s a MUST TRY as you said. Can we substitute butter instead of ghee and oil? Thank you so much :) Really happy to know that it came out well. You can use butter instead of ghee & oil. First of all I’m sorry for the delayed reply :( I was a busy with some project. Its nice to know that you visit this space regularly, thank you so much :) About using the carrot cake…may be you can crumble it and add some custard & fruits and use it as a pudding. Or again crumble the cake and make into small balls & dip it in melted white chocolate & let it dry completely. Bins – :), thanks dear. Btw, did you try anything with that cake? Hi Maria…I made this cake…this was my first time at baking and thanks to you, I’ve been hooked! I wanted to check with you if I could use some healthier flour other than maida…can nachni atta or wheat flour work? I have a one year old so was thinking of making it more nutritious. Look forward to your comment. Glad to know that you enjoy baking :) I’ve used wheat flour (atta) for some baking recipes. Though I’m not sure whether you can substitute atta for all cake recipes. May be you can try using half maida n half atta. Hi Maria ..Thanks for the wonderful recipes..I did bake the carrot cake( which turned out to be very soft and tasted good) and my kids finished it in a day.They dont usually prefer to eat veggies and I always look for some healthy , easy recipes to get some veggies into it.So this was a great one ! I made few variations- added 1?2 cup of garted coconut(dried),added garted clove n nutmeg instead of cinnamon.Once again hearty thanks and looking forward to new cake recipes…. Adding dried coconut sounds great and I’m sure that clove & nutmeg enhanced the flavor of the cake. Btw, please do check out the blueberry muffins & dates cake recipes. Hope you will like it. I’m sorry for the delayed reply, I was on a holiday & hence the delay. Hi Maria ..Thanks for the wonderful recipes..I did bake the carrot cake( which turned out to be very soft and tasted good) and my kids finished it in a day.They dont usually eat veggies and I always look for some healthy , easy recipes to get some veggies into them.So this was a great one ! I made few variations- added 1/2 cup of grated coconut(dried), and butter instead of ghee,also grated clove n nutmeg instead of cinnamon.Once again hearty thanks and looking forward to new cake recipes…. i made ur carrot cake many times ….came out very well.. kids loved it …..my friends hav got the recipe frm me … i made it for my husband’s b’day topped it with some fluffy vanilla icing… was great..!!! thanx a lot maria :-) i tried apple cake with th same recipe………..added grated apples…..was more juicy .. so didnt add all the juice…. that too came out well !! i made this today with honey instead of caramel syrup & 100% oil instead of ghee…good one ..kids loved it. Hope u r doing well. I am a regular follower of ur site. follow ur measurements and methods. Thanks a ton for this lovely comment. Sorry for the delayed reply, I’m away on holiday, hence the delay. I’m really thrilled to know that carrot cake was a huge hit at your place and your kids also enjoyed it. Thanks for trying the recipes from here. hhmm, I’m not sure the above qty will fit in 2 loaf pans. However it depends on the size of your loaf tin, if it’s small loaf tins, it should be ok. I used a 7 inch square tin for making this cake. Hope you could bake it sometime soon. Happy baking! Keep doing the good work and a big thank u to u and ur friend for this recipe. Thanks dear :) Good to know that the cake turned out well for you.. The baking time varies for each oven..
i tried making this cake…was a lil worried about the batter being a little loose…but the cake came out really well and is amazin !!! You are welcome Jeena :) Glad that it was liked by your family. Thanks a lot for the comment. Tried this recipe yesterday…came out very well…thanks Maria :) Baked it in my LG microwave oven and it took me exactly an hour in a 9 inch round cake pan to get it completely done. Thought of mentioning the time for the benefit of those yet to try it. I tried this recipe and thanks it came out so well! I always loved the carrot cake my friends mom used to prepare but she never disclosed the recipe :) Thanks to you that I was able to get the recipe and try it ..
Nice to know that you got the recipe you were looking for! I’m really happy that you liked the cake recipes. Hope you get to try more baking recipes when time permits. I tried . But it sinks while baking. Tastes delicious. Oven temp. 180 . Rest all cakes r perfect. Can u tell me why? I’m sorry to hear that it didnt come out perfect :( Please check out the below link. Hope it helps..
what changes would you suggest in the ingredient measures, if I were to use the same baking tray? looking forward to your reply…. I guess you can use the same qty of measurements listed on the site for your cake pan. However the cooking time varies for each oven, keep that in mind while baking the cake. I don’t have a conventional oven,only have microwave oven. I just wanna know whether I can bake the cakes you have uploaded in microwave oven.If so,please help me. Really happy that you liked the cake recipe. Thanks for sharing the pics too. Will add it on MM FB page in the next batch. Hi Maria, can we use the cream cheese frosting of your carrot cupcakes for this cake? Or can we make this into cupcakes? Yes, you can use that icing recipe. Also, you can make this cake as cupcakes too.. Thank you so much dear for your lovely comment :) I’m really happy to know that this recipe was a hit at your place. I’ll pass on your feedback to Divya too. If you like plain cakes, without icing, check out White Chocolate Mud Cake. It’s one of our fav cakes. Geetha here from Calicut. Made this wonderful carrot cake yesterday, the best ever I made. I am a baking frek and makes cakes occasionally but nothing to beat this one the highlight being using oil and ghee instead of butter. I have tried your other recipes too and everything turned out to be fine. Thanks a lot for sharing recipes as it is and the ingredients measurements correct if not cakes would be a disaster. Do post more innovative ones in future too.